This Edition: S Korea's New President; THAAD Update; Trump Admin NK Policy; N Korea's Nuclear Stockpile; Sanctions Legislation. South Korea’s new president, Moon Jae-in, was sworn into office on Tuesday immediately after winning a snap election to replace impeached president Park Geun-hye. Moon’s victory will bring South Korean progressives back into office after nearly a decade of conservative rule, and signals that Seoul will move away from the more hard-line approach to North Korea favored by Moon’s immediate predecessors in favor of greater inter-Korean engagement and dialogue. As a candidate, Moon pledged to revive elements of the “Sunshine Policy” favored by past South Korean progressive presidents, increasing economic and diplomatic engagement with North Korea – an approach that may cause friction with Washington’s efforts to tighten sanctions on Pyongyang. However, as analysts note, it may be difficult for Moon to move forward too quickly on this front, and his administration’s initial outreach toward North Korea could focus on relatively non-controversial issues such as family reunion meetings and North Korean participation in next year’s Winter Olympics in the South Korean city of Pyeongchang. President Moon has described Seoul’s alliance with the U.S. as “the most important foundation for our diplomacy and national security,” while calling for South Korea to take a greater role in international efforts to address North Korea’s nuclear program. Moon also supported President Trump’s statement of conditional willingness to meet with North Korean leader Kim Jong Un, and has hinted at his own willingness to meet with Kim in Pyongyang “under the right circumstances.” In a phone call shortly after his inauguration, President Trump invited President Moon to visit Washington. Although the new South Korean government’s approach to North Korea may be the biggest question for Washington, the South Korean election focused largely on domestic issues. 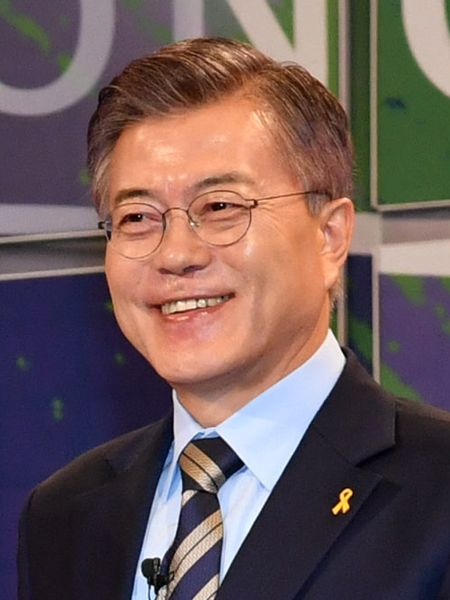 In the wake of the scandal that brought down Park Geun-hye, Moon has pledged to tackle corruption and reinvigorate an ailing South Korean job market, as well as to “disperse the president’s imperial powers as much as possible.” In order to make progress on some of his domestic and foreign policy priorities, Moon may have to work closely with South Korea’s National Assembly, where no party currently has a majority. Shortly before this week’s election, the U.S. and South Korea finalized the deployment of a THAAD missile defense battery to South Korea. The missile defense system’s primary mission would be to intercept North Korean short- and medium-range ballistic missiles aimed at military bases in the South; the THAAD deployment would not protect Seoul from artillery fire or short-range rockets and missiles, nor could it intercept an intercontinental ballistic missile aimed at the United States. President Moon has expressed some skepticism toward the THAAD deployment, arguing that the decision to finalize its installation shortly before the election “lacked democratic procedure.” In his inaugural address, Moon indicated that he would “negotiate earnestly with the U.S. and China to solve the THAAD problem.” Beijing, which has argued that the radar associated with THAAD would undermine its own nuclear deterrent, has imposed considerable pressure on the South Korean Government and private South Korean businesses over the deployment. Washington has also sent conflicting messages over the terms of payment for the system, causing consternation in Seoul. Additionally, Moon has emphasized the need for South Korea to develop domestic “Kill Chain” and “Korea Air and Missile Defense” (KAMD) systems to address the North Korean missile threat. These systems would be intended, respectively, to preemptively strike North Korea’s nuclear and missile facilities if South Korea faces an imminent threat, and to intercept North Korean missiles in flight. South Korea and the U.S. are also in the process of upgrading the Patriot missile defense systems deployed on the Peninsula. These systems could complement the THAAD deployment to form a “layered defense,” though KAMD could also potentially be developed as an alternative to THAAD. 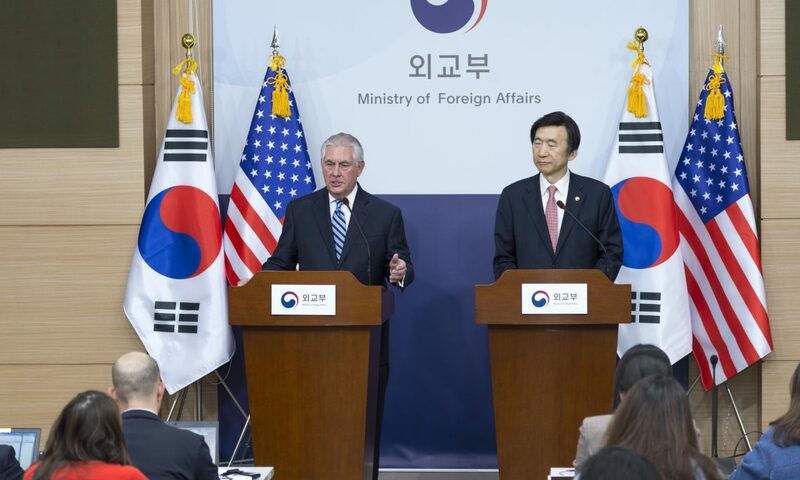 However, Secretary Tillerson has also signaled the administration’s openness to direct talks with North Korea, so long as Pyongyang has “the right agenda” and the goal of talks remains a denuclearized Korean Peninsula. President Donald Trump remarked last week that he would be “honored” to meet with Kim Jong Un “under the right circumstances.” According to a report in the Japan Times, the U.S. has discussed a proposal with China under which the U.S. would not seek regime change, collapse, or early unification if North Korea were to make concessions on its nuclear program. A recent assessment by the Institute for Science and International Security has estimated North Korea to have a nuclear stockpile of 13-30 weapons, with the capability to expand its arsenal at the rate of 3-5 weapons per year. The report assesses that North Korea likely has the capability to build a handful of plutonium-based warheads small enough to fit atop its medium-range Nodong missiles, and may be capable of producing similarly compact warheads using weapon-grade uranium or a mixture of fissile materials. The report also argued that “there are reasons to doubt” that North Korea currently has the capability to build a reliable, survivable nuclear warhead for an inter-continental ballistic missile. Last week, the House of Representatives passed a new North Korean sanctions bill, H.R. 1644 (the Korea Interdiction and Modernization of Sanctions Act), on a 419-1 vote. NCNK’s summary of the legislation is available here. The bill would significantly expand the scope of the U.S. sanctions regime, allowing the Executive Branch to impose discretionary secondary sanctions targeting North Korea's commercial activities. The bill would also expand on provisions introduced by last year's North Korea Sanctions and Policy Enhancement Act, broadening the scope of mandatory sanctions and adding new provisions on shipping and financial sanctions. 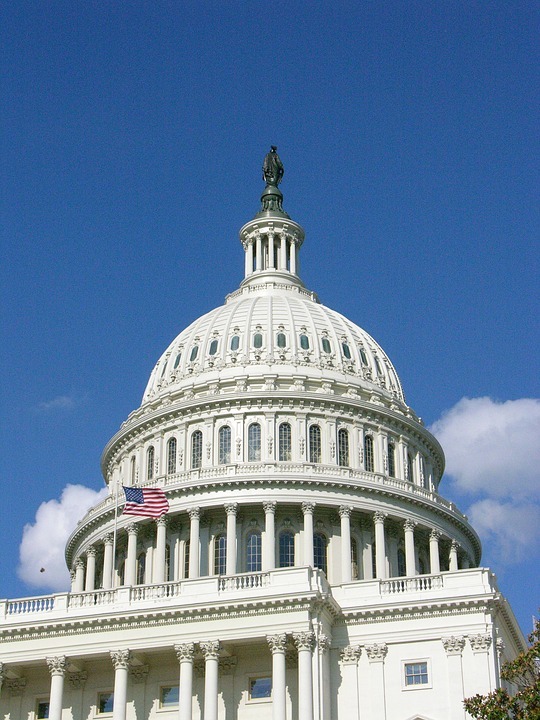 The bill now heads to the Senate, where parallel legislation has not yet been introduced. Early last month, the House passed H.Res.92, registering condemnation of North Korea’s development of multiple intercontinental ballistic missiles. The resolution also expressed support for continued U.S.-South Korea bilateral security cooperation, including the deployment of THAAD, and called upon China to pressure North Korea to cease provocative behavior. The House also passed the “North Korea State Sponsor of Terrorism Designation Act of 2017” (H.R.479) introduced by Rep. Ted Poe (R-TX). Citing cases of assassination attempts, cyber attacks, and material support to a Japanese terrorist organization, the bill calls upon the Secretary of State to submit a report within 90 days on whether North Korea meets the criteria for designation of a state sponsor of terrorism. An identical bill (S.672) was introduced by Senator Ted Cruz (R-TX) in March. This bill seeks to establish a joint commission of Asian countries, chaired by the U.S. Secretary of State, to coordinate political discussions on contingency responses to North Korean violations of UNSC resolutions, coordinate information sharing among intelligence services, create guidelines for multilateral action, and overall strengthen high-level dialogue about North Korean nuclear proliferation. This bill seeks to integrate intelligence relating to the monitoring and enforcement of UNSC resolutions on North Korea by coordinating all intelligence collection related to sanctions implementation, integrating early warning systems of proliferation activities, and identifying gaps in intelligence through the establishment of an “Integration Cell” that would report to the Director of National Intelligence. This bill would reauthorize the North Korean Human Rights Act, first passed in 2004 to promote human rights, transparency in the delivery of humanitarian assistance, and refugee protection, until 2022. This bill expresses ongoing concern about the unsolved disappearance of David Sneddon in Yunnan, China in 2004, and urges an investigation that includes consideration of the possibility that he was abducted by North Korea. Citing cases of assassination attempts, cyber attacks, and material support to a Japanese terrorist organization, the bill calls upon the Secretary of State to submit a report within 90 days on whether North Korea meets the criteria for designation of a state sponsor of terrorism. North Korea in the World: A new interactive website on North Korea's external economic and diplomatic relations created by the National Committee on North Korea (NCNK) and the East-West Center. This document represents the personal perspectives of NCNK’s staff.